It has been a busy time over the last few months in the stained glass publishing world, with volumes on a range of artists and aspects of stained glass now available, including those briefly detailed below. We hope to bring reviews of some of these, and of Jasmine Allen’s Windows for the World: Nineteenth-Century Stained Glass and the International Exhibitions, 1851-1900, flagged in a pre-vious issue of Vidimus, over the coming months. The Life, Art and Legacy of Charles Eamer Kempe, by Adrian Barlow (Lutterworth Press), 336pp., 234x156mm, £25.00. Published August 2018. This biographical study offers a radical revaluation of the life, work and reputation of Charles Eamer Kempe (1837–1907), one of the most remarkable and influential figures in late Victorian and Edwardian church art. Kempe’s name became synonymous with a distinctive style of stained glass, furnishing and decoration deriving from late mediaeval and early Renaissance models. To this day, his hand can be seen in churches and cathe-drals worldwide. Drawing on newly available archive material, Adrian Barlow evaluates Kempe’s achievement in creating a Studio or School of artists and craftsmen who interpreted his designs and remained fiercely loyal to his aesthetic and religious ideals. He assesses his legacy and reputation today, as well as exploring his networks of patrons and influence, which stretched from the Royal Family and the Church of England hierarchy to the lit-erary and artistic beau monde. These networks intersected at Kempe’s stunning Sussex country house, Old Place, his ‘Palace of Art’. Created to embody his ideals of beauty and history, it holds the key to understanding his contradictory personality, his public and private faces. Theodora Salisbury 1875-1956, Stained Glass Artist by Georgina Maltby and Andrew Loutit, 120pp., 210x250mm, £20.00. Published June 2018. Theodora Salusbury, an artist and craftswoman in the Arts & Crafts style, trained with some of the best artists in the field, before working as a stained glass artist at her studios in Cornwall and London. Her windows date mostly from between the two World Wars and were destined for nearly thirty churches in England and Wales, several of them in Leicestershire, her home county. The impact of her windows stems from her use of bril-liant colour and her skilled representation of the figures. Most of her work bears her sig-nature, a peacock. This volume, produced by a cousin and by a great nephew of the artist, is the first to be written about Theodora Salusbury. It includes an account of her life, family, and back-ground, also a description of her production methods, together with suggested dates for her windows, lists and details of her known works and illustrations of all her existing stained glass which has so far been discovered. How to Look at Stained Glass, by Jane Brocket (I. B. Tauris), 256pp., 150x210mm, £12.99. Published May 2018. 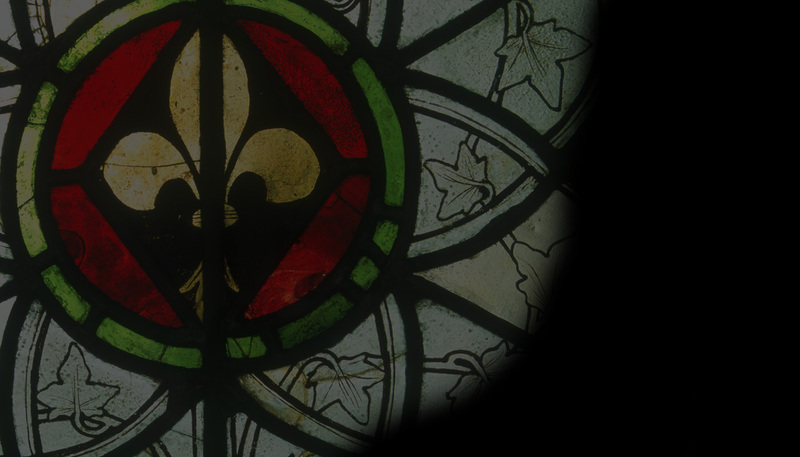 The magical qualities of stained glass have an enduring appeal, but church windows can be overlooked as a form of creative and artistic expression. How to Look at Stained Glass is a fresh, accessible guide, which explores the medium by themes, patterns, designs, and effects. Using an A-Z format to reveal a multitude of fascinating details, it makes looking at gloriously colourful, artistically important windows entertaining and rewarding. This layman’s guide requires no previous historical, artistic or religious knowledge; it covers all the major periods and styles from medieval to modern, Victorian to post-war, eight-eenth century to Arts and Crafts, figurative to abstract, and examines the fascinating and evolving iconography of stained glass. Stained Glass, by Aidan McRae Thomson, Britain’s Heritage Series (Amberley Publish-ing), 64 pp., 165x234mm. Published October 2018. In this new introduction to stained glass in Britain scholar and artist, Aidan McRae Thomson traces the story of this extraordinary art form from its early times, illustrating magnificent twelfth century windows from Canterbury Cathedral and elsewhere, before explaining the development of the stained glass medium through the medieval period, as new techniques were developed, and the art of storytelling in glass reached ever greater heights. During the seventeenth and eighteenth centuries techniques changed, and a new emphasis was given to non-religious subjects, but in the nineteenth century, medieval techniques and subjects were revived, and these windows from the gothic revival period constitute the great majority of our national collection of glass. The twentieth century has seen a new flowering of stained glass, and at both old churches and new, modern glass is a striking and highly effective feature. Using high quality colour photographs, this book explains the development and manu-facture of our remarkable medieval glass before giving full coverage to the later glass that fills the windows of most of our churches, great houses and civic buildings.